Handsome is a man, a woman, but rarely a child. Handsome is a Hemingway heroine, “built with curves like the hull of a racing yacht.” Handsome is Katharine Hepburn, Cary Grant, and every member of the Handsome Men’s Club. Handsome can be equine, old girl, full of vim and vigor. Handsome is well-constructed, sturdy, but not without refinement. Handsome can be gray-haired and possibly carrying a cane. Handsome is the default for a man, but particular for a woman. Handsome, coming from a misinformed speaker, can be an insult. Handsome is a craft. 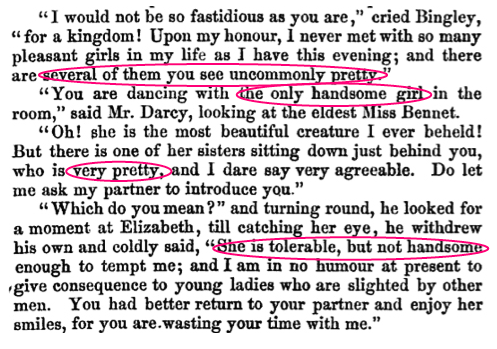 The one who is deemed merely “pretty” is, of course, Elizabeth Bennet, whom we’ve already learned is “not half so handsome” as her sister Jane. Elizabeth gets the guy in the end—but only after it’s been made clear that prettiness plays second banana to handsomeness in looks while ultimately reigning victorious in love. “Austen portrays the ‘handsome’ rival [as opposed to] her own ‘pretty’ heroine—as the old woman of parts, seen now as all too predictable,” writes Ellen Zetzel Lambert in The Face of Love: Feminism and the Beauty Question. “However virtuous...Austen’s ‘handsome’ woman is always condemned to play the other woman, the ‘pretty’ woman’s foil. Often an older sister or an older-sister surrogate, hers is the beauty that can be appraised by the judging man.” Today we champion the idea that Austen meant for us to root for the plain girl over the beautiful one, but in fact, on paper, we’re rooting for the pretty one. Of course, Austen’s use of handsome wasn’t necessarily shared by all. 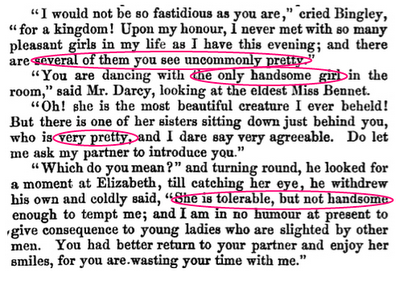 Not twenty years after Pride and Prejudice’s publication, The New York Mirror proclaimed in 1832 that “A handsome woman is handsome only in one way; a pretty one is pretty as a thousand.” The two ideas aren’t necessarily at odds, but throughout the book we see Jane as having an uncommon physical beauty, while Elizabeth's beauty is revealed through her quick, intelligent eyes and graceful manner—hardly the cookie-cutter gal that the Mirror gives us. 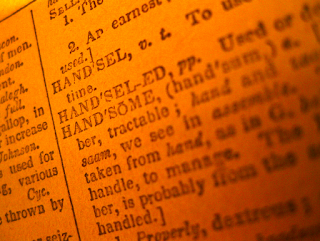 It’s this—striking, imposing—that explains why we still use handsome for men as a general synonym for good-looking, while we reserve it for a particular type of good-looking woman, even if we can’t quite agree on what type that might be. With the exception of cherub-faced cutie-pies, good-looking men of many stripes are routinely referred to as handsome: classically good-looking George Clooney, of course, but also fine-featured Ryan Gosling, bushy-browed Clive Owen, chiseled Brad Pitt, manly-man Javier Bardem, smoldering Taye Diggs, or Johnny Depp, who was once described by a fellow I knew as "required by law to be considered good-looking by everyone who has ever lived." For good-looking women, handsome is a descriptor; for good-looking men, it’s the descriptor. The traditional rules of masculinity dictate that we’ll take our men striking and imposing as a default, just as we’ll take our ladies demure. We also describe men as beautiful, hot, cute, and good-looking, just as we do with women, but beneath most of these (with the possible exception of cute) lies an assumption of the strength and fine construction that’s already built into the default definition of handsome. The rough equivalent of a default compliment for women—beautiful—can imply a sort of divine harmony, a grace that must be inspired, not constructed. We want our men built, our women magic. 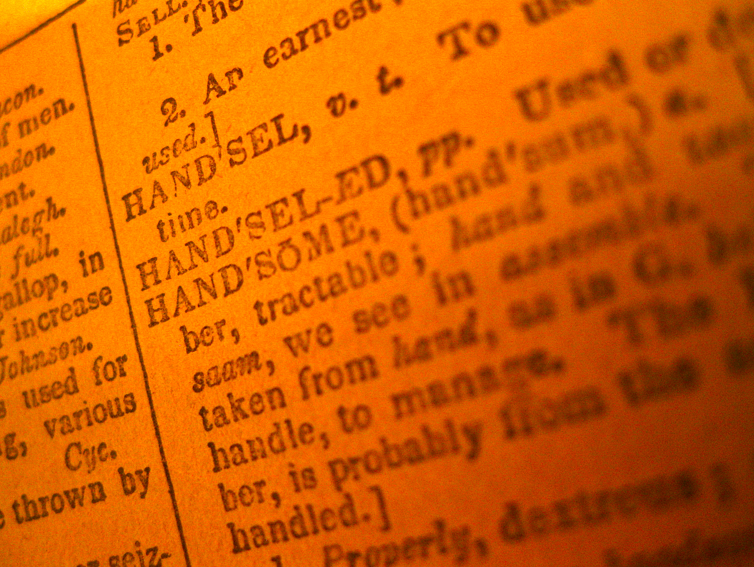 The craft of handsomeness keeps it available to any woman or a man given a good set of genes. But it's only women whom society requires to go above and beyond fine construction into the realm of beauty. On the rare occasion i use the word "handsome" there is no thinking, it's just there. When using "pretty", "attractive" or other adjectives, i have to think whether this is the term i mean. But, for me, handsome just is. No apparent use of beauty enhancers are part of those i consider handsome, just their appearance. Muscles, btw, are not handsome, imo. Your comment about age rings true, however, as i cannot think of anyone i consider handsome who is under 35 or so. So, narrowing my definition as i type--no muscles, no makeup, no youth and it's obvious that the word perfectly fits them. How easy was that? Ha! For some reasons, my English teacher told me I was a handsome girl at our first encounter when I was 15 years old. At that time I was bewildered but still took it as a compliment. "Your comment about age rings true, however, as i cannot think of anyone i consider handsome who is under 35 or so." Expect me of course, because I am under 35 years old and I am so very much hansome. Interesting! I never describe any woman as "handsome," having been mistaken for a man far too many times, but I don't hesitate to describe men as "beautiful" or "pretty". I use "striking" to describe women who might be considered handsome. I can't find it just now, but somewhere in the Mary Poppins books, she is discussing her appearance with someone and corrects whatever that person said by saying something like, "Handsome is more like it." Of course, Mary Poppins is magic. Or something. So, does a pretty woman turn handsome? Or does a beautiful woman turn handsome? If handsome is a later-in-life look, who becomes it? Can anyone grown into handsome? With effort, of course...? am I the only person who does NOT consider Johnny Depp to be "handsome"? He is kind of cute and has a quirky attractiveness to him, but in my mind he lacks the gravitas and manliness that, together with pleasing physical features, is what I associate with the word "handsome". George Clooney, Sean Connery, that guy on Mad Men, that man in the commercial that my man could smell like--now they're what I consider handsome. Johnny Depp, Brad Pitt, the Ryans, and all the twilight dudes--they're just what I would call "nice looking". I was called "striking" some years ago by a man who wished to flatter me--I was in my 20's & I was somewhat offended. I felt he was saying that he didn't think I was conventionally pretty but he was attracted to me anyway and he thought I should have been flattered by that--gosh thanks, dude! Oddly, I'm now officially old (50 years old! OMG! ), divorced & dating, and men who wish to compliment me these days always say that I'm "pretty" or "beautiful" or even "cute"--I never get the "striking" or "handsome" comments any more. Anyway I think compliments/judgements probably mean more about the person giving them, than about the target. I indeed consider 'handsome' to be the optimal descriptor for male attractiveness, but that is probably not true for many younger women. I imagine that plenty of women prefer "hot," "cute," or "good-looking," because they may consider handsome to refer to a specific culturally mainstream view of what an attractive male should be. I also agree that the word seems to have a lot to do with perceived character traits as well as physical appearance. It has also gone out of vogue to describe most things besides a good-looking male - we no longer discuss handsome window treatments, and only rarely do we reward someone handsomely for their efforts. I guess that 'handsome' probably implies a degree of privilege or elitism, too. 'Handsome' is so associated with dignified dress and composure, which are strongly associated with cash. Bothersome, excellent point about how beauty enhancers don't fit in with "handsome." It's not a part of the classic definition but I certainly feel that way now that you bring it up--perhaps it's because of the idea of construction? That you can't hide--or fake--a good line? Marsha, we can make an exception for Mary Poppins: handsome AND magic! Cameo, good questions, and I don't have an answer on the level of researcher, just as a person. It seems that one does grow into handsomeness but that it's something that needs to part genetic--sort of like physical beauty but leaving aside that question of divine inspiration. IMHO not everyone could grow into handsome--I'm thinking of some older women I know who are very well-kept and what I'd call pretty, but there's a delicacy there that would prevent me from calling them "handsome." Angela Lansbury comes to mind--she has this softness about her that makes me think "pretty" rather than "handsome," though certainly if someone called her the latter I wouldn't question it. Karen Iris, you and Broads of the Beltway may be the only two! I don't usually go for the type of man that everyone agrees is good-looking, but I really can't argue with either him or George Clooney. But I hear you about the quirkiness that is part of his appeal--I see his physical construction as handsome, but the very personality of him could indeed preclude handsomeness. And TOTALLY agreed that the compliments say more about the person giving them than the target. Broads of the Beltway, heh, good point about Jon Hamm's appeal rising when he's on-duty. I find that I'm more apt to develop a little crush on a character more than an actor, if that makes sense. As far as younger women preferring "cute" or "hot" to "handsome" when describing men, I agree--I didn't call men "handsome" when I was 20. Classic handsomeness requires a sort of maturity that you might not find appealing at a younger age. I have -- at and before age 30 -- been considered "handsome" a number of times. I think that the intent has been largely positive: It's a way to describe a tall, large-framed, plus-size woman as attractive while implicitly acknowledging that she doesn't fit conventional specifications for terms like cute, pretty, or even beautiful. Tori, interesting! I can see someone saying that specifically for the reasons you said. May I ask how you felt upon hearing it? I take it as a pretty positive term, perhaps largely for having grown up among horsefolk. There, while handsome is a male equivalent for "pretty," both tend to reference a serviceability that has more to do with athleticism and grace and less to do with inanimate aesthetic. Also, while horse terms -- handsome/pretty -- are gendered, they're somewhat less gendered than for humans (perhaps due to gender expressions being less evident), so I've heard a fair bit of "handsome" and "pretty" used... not quite interchangeably, but with a lot of overlap. Amazing post! It gave me what I was looking for and more. I was just searching around the net after reading a passage from G.R.R. Martin's A Dance with Dragons talking about Septa Lemore being more "handsome than pretty". I was mystified by how it was used and just had to search it online. And yes, the character is an older woman with a beauty more of body than of face, which may run parallel with some of the ideas presented in your post. Inn, sorry for the late reply--so glad that this could help you suss out what Martin was after with that character! Assuming Septa makes it to the HBO series adaptation, I wonder who they'll get to play her? I think a handsome woman, or even a girl for that matter, has a magical aura around her. A man would like to be influenced, making no issue about his playing the second fiddle. The masculine admiration of the handsomeness in a woman should be by nature spontaneous. The physical features, of course, play their role in shaping that total effect and there has to be at least one such dominating feature, say a husky tone or a prominent cheek-bone, that defines the particular shade of handsomeness in the woman. You would think by now that we could say unequivocally what causes what. But the question of cause, which has haunted science and philosophy from their earliest days, still dogs our heels for numerous reasons. Humans Nike Air Foamposite One are Men Air Max 90 evolutionarily predisposed to see patterns Women Air Max Motton 2014 and psychologically inclined to gather information that supports pre existing views, a trait known as confirmation bias. We confuse coincidence Basketball Nike KDurant with correlation and correlation with causality. For A to Nike KD Shoes cause B, we tend to say that, at a minimum, A must precede B, the two must Nike Free Dynamo covary (vary together), and no competing explanation can better explain the covariance of A and B. Taken alone, however, these three requirements cannot prove cause; they are, as philosophers say, necessary but not sufficient. Women Air Max 90 In any case, not everyone agrees with them. Speaking of philosophers, David Hume argued that Nike Lebron Shoes causation doesn't exist in any provable sense. Sneaker Online Karl Popper and the Falsificationists maintained that we cannot prove a relationship, only disprove it, which explains why statistical analyses do not try to prove a correlation; instead, they pull a double negative and disprove that the data Nike Free 5.0 are uncorrelated, a process known as rejecting the null hypothesis. With such considerations in mind, scientists must carefully design and control their experiments to weed out bias, circular reasoning, self fulfilling prophecies and hidden variables. They must respect the requirements and limitations of the methods used, draw from representative samples where possible, and not overstate their results. With people becoming more and more health conscious, the nurse business is booming Cortez Yoth and they are in demand like never before. Over the past decade, the demand has risen and, therefore, more and more young people are interested in following the career path of a nurse. Let us individually examine the growth chart at different levels. Registered Nurses or RNs: Registered Nurses or RNs are nurses with the Bachelor of Science in Nursing degree. They form the basis of the nursing population and over the next few years, the demand for them is likely to increase, because of the number of clinics flourishing all over the country. While they are Nike Shox TLX Mens Shoes very handsomely paid, they are at the bottom of the pyramid and are easily afforded by clinics. Hospitals need more specialized nurses, therefore, RNs working in hospitals tend to study further and move up the pyramid as soon as Nike Air Presto High possible. Over the next five years, the requirement for RNs in private clinics is bound to go up be nearly 50 percent while those in hospitals will be just about 15 percent. The demand for them Nike Air Jordan Mens for at home services would also see a 25 percent surge. The average salary would be $65,000 annually. Nurse Practitioners or NPs: The demand for Nurse Practitioners or NPs will see an increase, in very specific areas. The old age population of the country Nike Free Run 5.0 Kids Children Shoes is going to be very interested in hiring NPs as their personal helping nurses. In hospitals, the demand would be very high in the preventive healthcare sector. The average salary is estimated to be around $90,000 by the end of this decade. Most RN's in the hospitals will be seen adding the necessary degrees Nike Air Mission Classic Mens Shoes and certifications to Nike Zoom KD VII 7 become NPs. Clinical Nursing Specialists or CNSs: Clinical Nursing Specialists or CNSs are advanced nurses and would be able to multitask with ease. They would be required to perform medical duties as well as help in the administration. The demand for them is said to have increased and Designer Shoes will keep on doing so to better the healthcare administration and improve services. Nike Dunk Mid Mens Shoes A CNS is said to bring in about $88,000 on an average, annually. Certified Registered Nurse Anesthetists or CRNAs: As the career graph peaks, RNs and NPs tend to look for a career path change, trying to specialize and find a domain for themselves. With advances in medicine and surgery, a lot of these nurses are trying to become Certified Registered Nurse Anesthetists or CRNAs. They take in an average salary of $156,000 annually, being the most highly paid of the Nike Air Max Mens nurses. The demand, the specialization and the salaries definitely make nursing one of the most sought after career choices these days. six-day APEC meeting ended. The G20 summit in Cannes, immediately launched the Asia-Pacific Forum, intended to look through the Economic Cooperation summit to promote closer cooperation areas, reduce trade barriers and promote economic growth in the Asia-Pacific region to deal with the debt crisis as the host of the United States, the use of this forum, The hot topic of the steering TPP. It had only four small countries to establish in 2005 a multilateral free trade agreement, after Nike Air Max 2013 Femme Obama took office, the United States will participate and play a leading role in the Burberry Nike Air Max 2011 Homme Womens Wear strong, have joined with the plurality of regions and important position within the country, or will become the United States in the Asia-Pacific trade Strategy TPP new arena from humble small business alliances, and gradually evolved to encompass most of the Asia-Pacific trade organization, to date, the United States has not yet joined the TPP deny opportunities in China, but China has not been invited to participate in the meeting Obama During repeated direct requests to act in accordance with international Burberry Hobo Bags trade rules China. Downturn in the domestic economy, the presidential election Designer Burberry Outlet nears, Obama made gestures at APEC, we should Burberry Coats also face domestic political considerations Obama bluntly to revalue its currency, the Chinese President Hu Jintao reiterated the current exchange rate is appropriate, but also stressed even if the RMB appreciation will not improve the US trade imbalance. Chinese officials also reiterated the no so-called 'international trade rules' Chinese participation, China has no obligation to comply. This statement realistic Obama criticized China's policies, the United States should also step back and introspection, the plight of the US economy today Nike Site Officiel is derived from Wall Street. Whether Capitol Hill or the White House, inside holding power of politicians mostly belong to the 'Occupy Wall Street' protests object that is the wealth of the 1%. Get tough on China or part of the electorate acclaim, but will not help solve the country's livelihood issues APEC meeting has ended, but the economic Nike Free Run 3.0 Homme cooperation and development in the region will continue. A week later, at the East Asia Summit held in Bali, the United States and the Russian president will be the first time participants. Chinese Premier Wen Jiabao will also be attending, it will be China and the US following the G20 and APEC leaders after the third meeting within just one month. Then the parties discussed issues will also be extended to the political economy, regional security and stability more Burberry Swimwear difficult problem. With nearly Nike Free Run Run 2 Homme half the world's population, 55% of the global GDP of the region, just as the vast expanse of the Pacific Ocean in front, although sometimes thunderstorms hurricanes, but only to help each other in order to survive the difficult moment. Very much impressive site that will catch the attention of everyone and very genuine idea...Thank you for posting this valuable site. movers and packers jaipur . What I love about this blog feature is that you're able to get so much information out of one word!